At night from Culebra you can many times catch a glimpse of one. A cruise ship traversing the Virgin Passage either bound to or from the ports of San Juan in Puerto Rico or St. Thomas in the U. S. Virgin Islands. 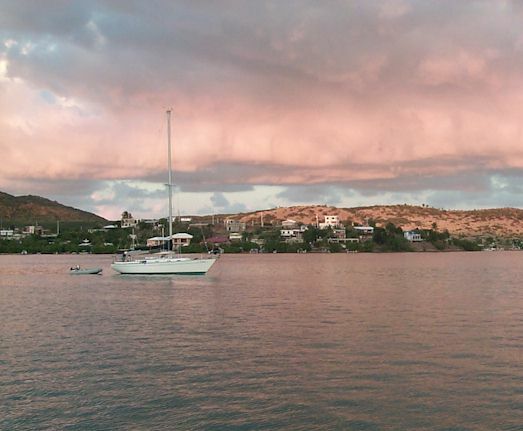 Their itineraries include many of the places we have visited aboard Bellatrix but they never stop here in Culebra. When a cruise ship makes a port call the local community always springs into action. It’s a resource to be mined for its money. The hundreds of holiday-making passengers are the raw ore and with the firm application of taxi rides to the beach, catamaran day charters, local crafts, Columbian emeralds, and, of course, t-shirts and ball caps the money can be extracted. Of course alcohol is always a helpful catalyst. This is a major part of the tourist industry and it provides a livelihood for many Caribbean people and that’s a good thing. But there’s always the impact and the changes to local communities brought on by such high-volume visitations. It sometimes seems that each community receiving cruise ships is transformed into a Disney-like attraction where only caricatures of Caribbean culture and history are presented. We see bars and day charter boats sporting the Jolly Roger and other piratical accoutrements and, of course, there are the fun pirate games. Everybody knows that the pirates of old cut their rum with tropical fruit juice medleys and, when sufficiently liquored-up, would race hermit crabs on the beach. They were a tough bunch. Seriously, it’s all great fun but, with reality taking a back seat, no cruise ship passenger should expect immersion into real Caribbean culture. Or even a quiet retreat. I remember reading Hemingway’s Islands in the Stream where he talks of out-of-the-way places where tourism was limited to a few small hotels and guest houses that appeal mostly to connoisseurs of peace and quite. Existence on these islands didn’t revolve around tourist visitations. Life progressed in the same manner in which it always has and visitors with enough patience and gentle mannerisms can sometimes feel the essence of what it is really like to live in such a place. There are places on most every island reminiscent of Hemingway’s descriptions. They are remote from the high-volume tourist track and one of the advantages of traveling by yacht are the opportunities afforded by such a conveyance to venture off the beaten path and visit these places. We are in Culebra, which is an island belonging to Puerto Rico and is located roughly halfway between St. Thomas and Puerto Rico. When we first went ashore we tied the dinghy to the Dinghy Dock, which is indeed a dinghy dock but, more so, a local watering hole. From there we had to walk to the other side of town to check in with customs. The town was filled with bright and friendly people going about their daily business none of which involved trying to sell us trinkets and t-shirts. Everyone had better things to do. There were a couple of shops where a visitor could buy souvenirs but most of the shops were there to provide the residents with their daily needs. The name of the town is Dewey and it’s pretty much like the towns many of us come from. It’s a place to live with no distortion caused by large-scale tourism. The unique "Spanglish" culture predominates. We tried our Spanish but, since most everyone is bilingual, the folks we conversed with immediately reverted to English rather than listen to us stumble. It is unmistakably Latin American however and we delighted to the sound of Puerto Rican music playing on the radios in every shop. We shopped for a few items at the small supermarket and received a complimentary calendar. We were honored. It indicated to us a measure of acceptance. When we returned to the Dinghy Dock the regulars had begun to ensconce themselves on their bar stools. A collection of local Puerto Ricans and ex-patriots from mainland America. Visitors were welcome but this wasn’t typically a tourist bar. Any suggestion to race hermit crabs would probably not be well received. I should not be presumptuous and speak for him but I cannot help but think that Hemingway himself would like this place. Indeed he would like the whole island. While we enjoyed a beer at the Dinghy Dock Linda suggested to me that Culebra just may be what Key West was like before the tourist trolleys. 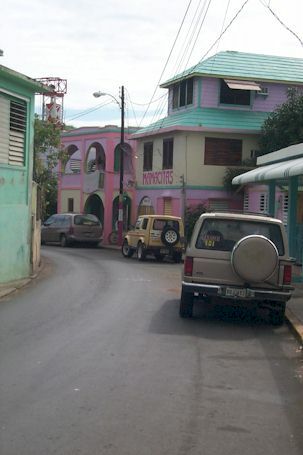 Visitors come to Culebra on small planes, ferry boats, and private yachts. Few expect to be entertained or have their day filled with someone else’s itinerary. Most are able to establish their own itinerary. There are the beaches, the scuba diving is excellent, and of course there is the Dinghy Dock or Momasita’s a few blocks away. Just walking around and soaking in the culture is enough for some. The cruise ships keep passing Culebra by. As the two of us sit aboard Bellatrix and watch their lights grow dim on the distant horizon we hope that they will always pass Culebra by.